We are told that on the current issue of the Soul Magazine there is an article on Bld Alexandrina: “The Current SOUL magazine has an article on Alexandrina”. We studied for years a detail of the relationship between Fatima and Balasar. The proclamation of the Consecration of the world to the Immaculate Heart of Mary was made in the Apparitions Jubilee, on 31 October 1942. So we wanted to see what three newspapers of the time said, one of the Diocese of Braga and two of Porto. And the findings were interesting. The Jubilee was celebrated in Lisbon, because there was no basilica in Fatima, and was prepared in advance. The day before, the Cardinal of Lisbon spoke to the country, but didn’t say any word about the Consecration; the daily newspapers made the same on the following day. Everybody ignored it. Two days later, news arrives from Rome and then the newspaper of the Diocese of Braga starts talking about it. The proclamation seems to have been made ​​among fears. 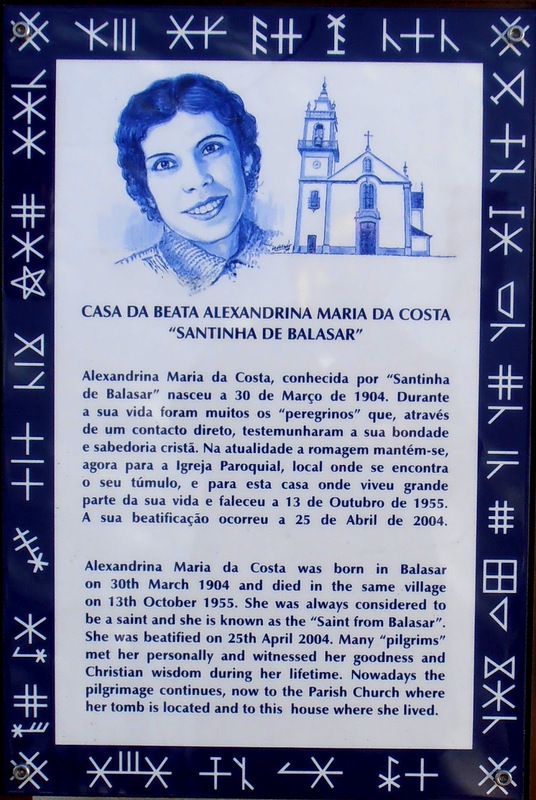 At that time, Balasar didn’t have yet electric energy and so Alexandrina could not hear nor Cardinal or Pope (who spoke in Portuguese). So she learned that the Consecration had been made ​​by telegram Father Pinho sent to her... from Fatima. I prayed the Magnificat and ordered my sister to light a lamp in honor of Heavenly Mother. Yesterday an American group of about twenty Pilgrims for Peace, mostly from Virginia, came to Balasar. After visiting the House of Calvary, where they heard an explanation on the Holy Cross and its relation to Alexandrina, went to the Parish Church, prayed the Rosary and visited the Beata’s tomb and then the chapel of the Holy Cross. Maria Rita Scrimieri, who is currently in Balasar, also spoke to the pilgrims. After the morning, they went to lunch, to follow later to Fatima. The day before they had been in Braga. In the House of Calvary, there is now a panel with biographical news on Alexandrina, in Portuguese and English. An Archdiocesan Week of the Sick is being held in Balasar.